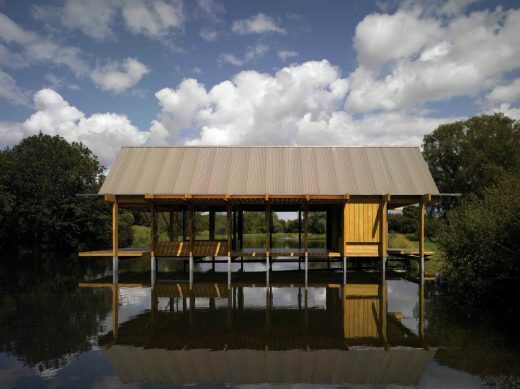 Situated on a lake, the Fishing Hut is a shelter and tackle store for anglers that come to fish there. It is designed to be as open as possible when in use and closed when not. 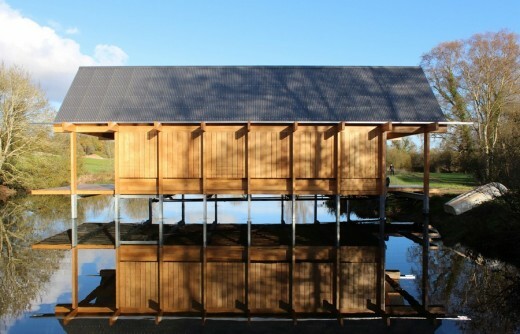 The simple, barn-like form and cladding echo the vernacular of modern agricultural buildings. An array of shutters open to reveal a golden timber interior that is reflected in the lake. 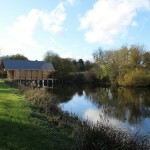 The Fishing Hut provides a shelter for the anglers that come to fish in the river and storage for boats and fishing tackle. 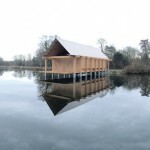 The hut includes a covered boat mooring, making it necessary to build it out over the lake. 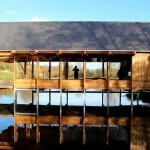 To accommodate seasonal flooding the floor of the hut is raised up above the water level. The building is supported on 18 pad foundations formed of precast concrete drainage rings filled with concrete. 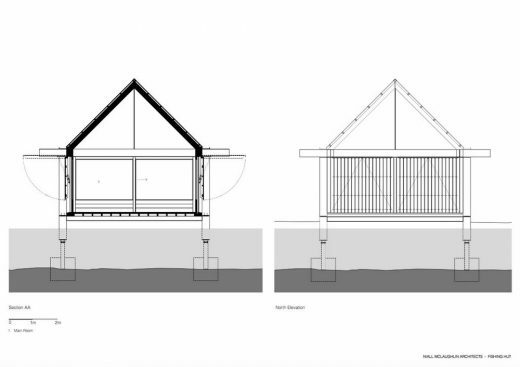 9 steel goalpost frames are fixed to the foundations to support the timber floor structure and the glue-laminated Oak superstructure. 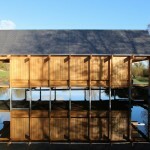 The roof is made of softwood rafters, clad internally with Oak boards and externally with profiled aluminium sheeting. The plan is divided into 10 bays. Pairs of bays at each end form open decks, partly covered by the overhanging roof. Below the eaves, shutters and cladding formed of open jointed timber planks enclose the six central bays. This enclosure comprises a weather tight internal space of four glazed bays and a semi-enclosed storage area. The first bay of the internal space contains an entrance lobby, WC, kitchenette and dining area. The storage area beyond contains a loft for boat storage, an external shower and covered mooring. A primary requirement of the project was to produce the greatest possible sense of openness when situated within the building while maintaining security when not in use. 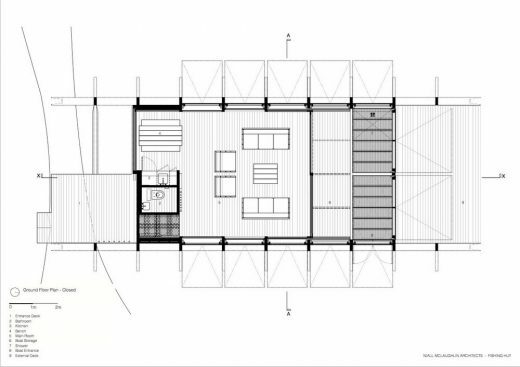 Resolving these conflicting demands lead to the development of the building’s facades as a series of movable screens that allow the user to modify the internal environment of the hut. We used physical models to explore possible solutions to providing an external shutter that screens and shades the building interior without obstructing views out when open. The final solution, a top-hung hinged shutter, gave the least obstruction, but required the shutters to be raised from vertical to horizontal and held securely in each position. A full scale mock-up of a shutter was constructed to test operating mechanisms and enabled the final solution to be developed. Each shutter consists of a timber frame and cladding and operated by a pair of weather-proof motorised struts fixed on purpose designed and fabricated stainless steel brackets. The electrical control gear links banks of shutters together to allow them to operate in unison, allowing the building to slowly unfurl its wings in perfect synchronisation. 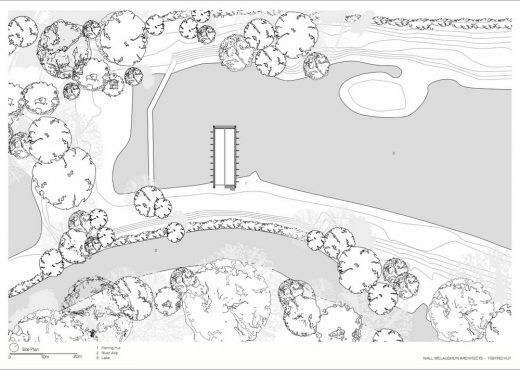 The site for this project is of very significant ecological importance at both a national and European level. The need for the project is generated by the Client’s aim of securing the long-term protection and conservation of the riverine environment through sustainable economic use as a site for anglers. In this way the protection of the environment is at the heart of this project. 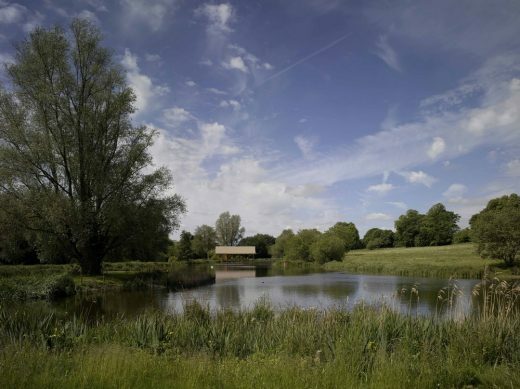 Due to the particularly sensitive nature of the site great care was taken to ensure there was no damage or adverse impact on the local environment during the construction and use. The design also considers its impact on the wider environment through the use of materials selected for their inherent durability for each specific component to maximise life expectancy, limit maintenance and minimise embodied energy. 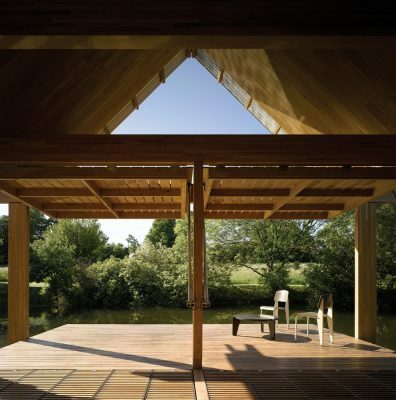 The majority of the structure is formed in Oak, an indigenous and sustainably sourced hardwood whose natural durability allows the construction to be untreated externally. The exterior timber will weather to match the silver-grey colouring of the roof cladding and steel supports. The primitive hut has a long anthropological pedigree as well as an architectural one. 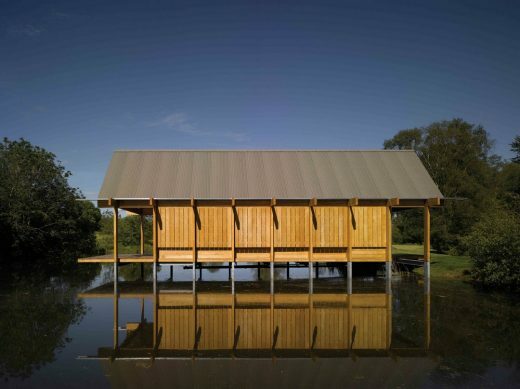 This is a sophisticated primitive hut, worthy of Murcutt or Leplastrier but set not on the edge of the Bush but on a Hampshire lake, close by chalk-filtered streams providing watercress beds and fishing.The timber-framed and clad construction on galvanised supports hovers over the lake, intended as a retreat for fishermen and a place for the owner’s family to unwind. 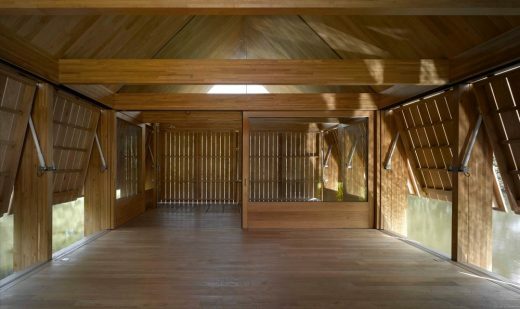 But it as much about time passing as it is about fishing: crafted slatted timber panels which allow the building to ‘hunker-down’ in the winter, open up in the spring to become delicate brises soleils. 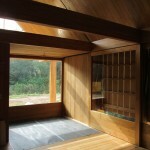 Timber framed glass screens slide away. Within a few moments in time a solid building is transparent. 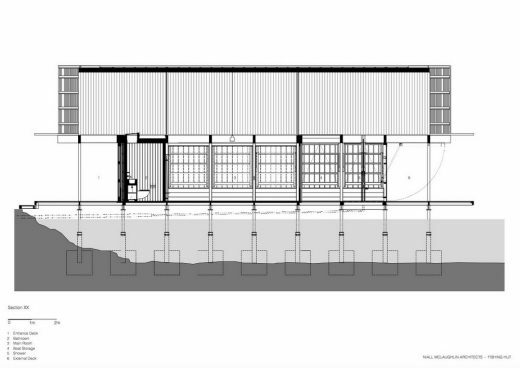 16 Oct 2014 – Denizen Works’ house no 7 winner of the Stephen Lawrence Prize 2014. This unusual house is located on Tiree in the Western Isles of Scotland.